Quinoa is pronounced “keen-wah”. When I journeyed to Peru a couple of years ago with our son, Robert, he and I enjoyed this traditional grain salad on the balcony of a small restaurant about an hour from Cusco at 11,000 feet in elevation. While waiting for our food we noticed a bowl of small green leaves on our table. We were told that these “coca” leaves were a powerful stimulant and should be added to our hot tea if we had trouble acclimating to the local elevation. I tried them in my tea but our son did not. I can’t say I liked the sensation. I can say I liked the Quinoa salad they served. When we returned, I tried to duplicate it and think I got close. I like to serve on a bed of crisp, cold butter lettuce. Rinse the Quinoa and combine in a sauce pan with 2 quarts water. Bring to a boil. Reduce heat and simmer for approximately 12 to 14 minutes or until all the grains of Quinoa are translucent. Drain Quinoa and transfer to covered bowl. Place in refrigerator to chill for about 30 minutes. Whisk together lime juice, chiles and oil. Set aside (be sure to wash your hands with plenty of soap and water after handling the chiles). 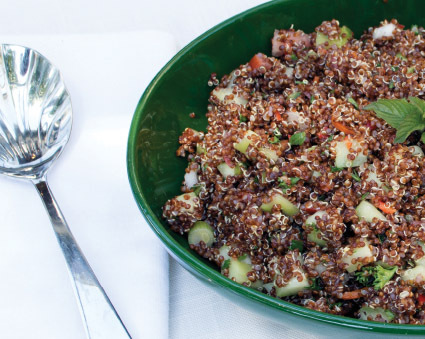 Combine chilled Quinoa, cucumber, tomato, green onion, parsley and mint in large bowl. Mix gently. Pour juice mixture over the top of this mixture and toss to mix. Add salt and fresh ground pepper to taste. Cover and refrigerate until ready to serve. This recipe makes a bunch of salad and will put a smile on many hungry friends at your next potluck gathering. Tip: If you do not have grape seed oil this tastes just fine with a good extra-virgin olive oil.